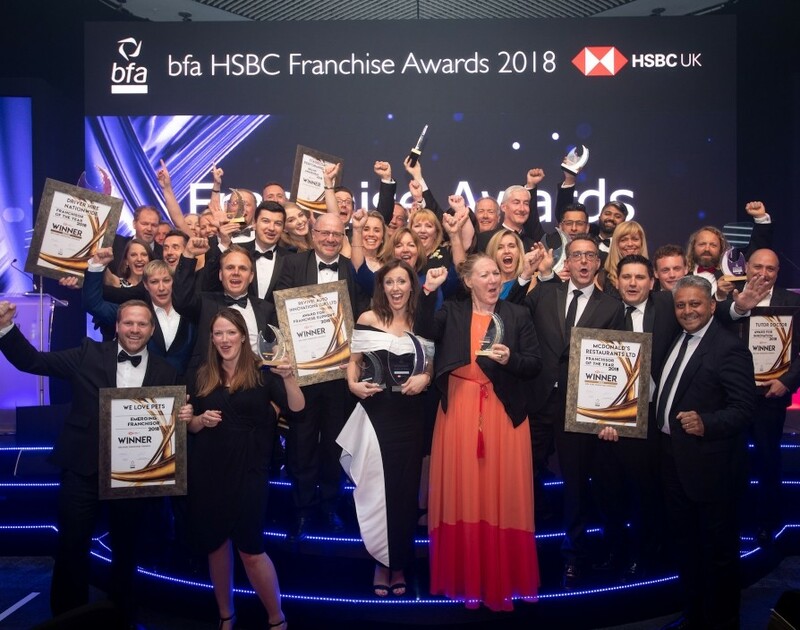 Since the announcement of the bfa HSBC Franchise Awards finalists in February, offices of nominees across the nation will have been brimming with speculation over who will be this year’s franchising kings and queens. Finally, following a black tie ceremony at the ICC in Birmingham, all has been revealed. Of course, business can’t happen without customers coming through the doors. It’s a target which saw a franchisee of Dyno-Machmade, the plumbing and heating franchise, bag the Customer Focus Award. This marks the second year running that a Dyno franchisee has won the gong, speaking volumes about the company’s customer-grabbing smiles. The franchise model rewards expansion like no other. Just ask Diljit Brar, franchisee at Costa Coffee, whose army of 71 franchises blew past the prerequisite of three for the Multi-unit Award and demonstrated enough sustainable growth to take the trophy home. Indeed, that in itself makes it clear networks are at the core of franchises and Neil Hatt, franchisee at InXpress Birmingham, the shipping franchise, knows it more than anyone with the Network Contribution Award in hand. Although while it’s important to appreciate tried and tested franchisees, don’t forget that even the best began somewhere. There’s no better example than Almas Adam, franchisee at Right at Home Loughton, the home care franchise, who lived every new franchisee’s dream after taking home the Young Franchisee of the Year award. To highlight the second crucial half of the franchising relationship we have the Emerging Franchisor of the Year award. And this year We Love Pets, the pet care franchise, got its paws on the prize after judges recognised its strong investment plans and reinvestment strategy. Getting your image out there is the aim of the game given the vast heights franchising can reach. Indeed, Stagecoach Performing Arts, the performing arts franchise, put on a fantastic show in securing this year’s Brand Awareness award thanks to its stellar brand overhaul. Given the ever-evolving demands of consumers in the internet age, lack of innovation can quickly grind industries to a halt. Fortunately we can look up to Tutor Doctor, the private tutor franchise, which won this year’s Innovation Award after launching its real-time online whiteboard, Bramble. The franchise model simply wouldn’t exist without franchisees to give it meaning. Therefore, nurturing them to success should be top priority for all franchises as it is for Revive! Auto Innovations, the mobile car repair franchise, which secured the Franchise Support Award. Given it won the Brand Builder category in 2013, this franchise has all angles covered. Despite the huge successes, there was still room for the highly contested Franchisor of the Year award. Indeed, competing in a pool of six nominees this year saw heavy hitters Driver Hire Nationwide, the logistics recruitment franchise, win bronze, Agency Express, the estate agency, take silver, and McDonald’s claim gold. While simply making the shortlist is cause enough for celebration, this year’s winners set successful standards to follow for franchises envisaging their names in lights.